Captive Queen Of Scots 1568-1587 : Life in England. Mary, Queen of Scots, lived almost half her life in England. 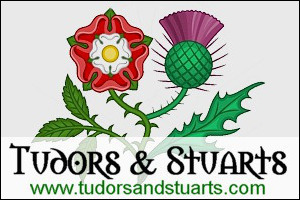 When the Scottish Queen arrived in England in the May of 1568 she was in a desperate plight. 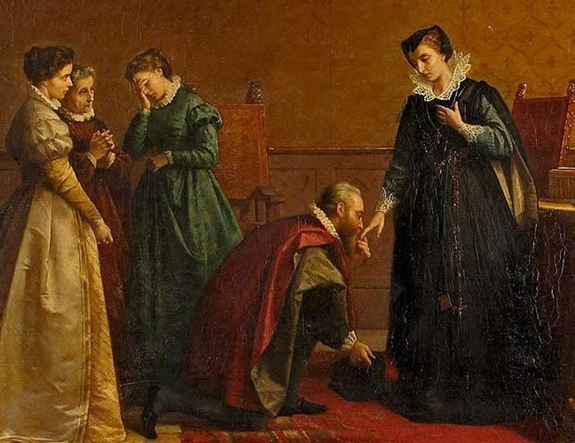 Not only had she been forced to abdicate from the Scottish throne in favour of her infant son, James, but she had been imprisoned in Loch Leven castle by the powerful Protestant Lords. Mary had managed to escape, but her attempt to reclaim her throne in battle had failed. The Queen, disgraced by her husband's murder and subsequent remarriage to James Hepburn, Earl of Bothwell, had few friends and even the great Catholic powers of Europe had turned against her. The desperate Queen threw herself on Queen Elizabeth's mercy and Elizabeth, reluctantly, took her "under protection". In reality, Queen Mary was a prisoner. For the next nineteen years the unfortunate Queen was lodged in various castles and mansions around England, her main residence being Sheffield Castle in South Yorkshire. This was considered a safe distance from both Scotland and London. George Talbot, Earl of Shrewsbury (1528-1590), was appointed the Queen's keeper, and most of the properties Queen Mary stayed in belonged to him. His successor in 1584 was Sir Ralph Sadler (1507-1587) and then in 1585 Sir Amias Paulet (1532-1588). Queen Mary was given all the comforts of her status, had her own household of servants (many had been with her for years), and had sixteen-course meals four times a day aswell as two barrels of white wine a month. She also had her own doctor and apothecary. The Queen had her own pet dogs, that she loved, and at Sheffield Castle she set up an aviary of exotic and beautiful birds. However, the Queen was guarded day and night. No one could come or go without permission and, as the years went by and she became more of a risk, she lost more liberties and was not allowed outdoors as much. To pass the time, Queen Mary read books and embroidered a lot, and some of her work is now on display in Oxburgh Hall, Norfolk. The Queen also learnt English as she could only speak French, Latin and Scots. 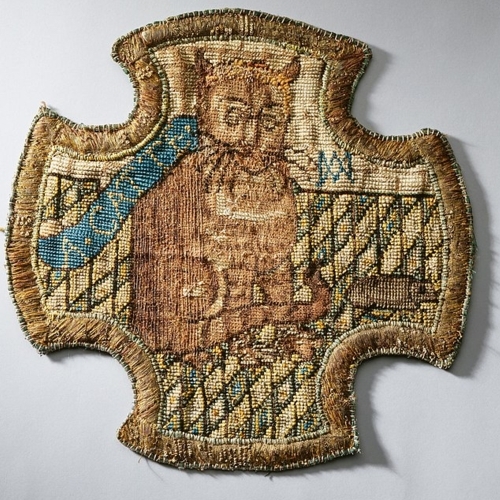 Needlework by Mary, Queen of Scots, while in captivity. Queen Elizabeth I is thought to be the cat, Mary the mouse! 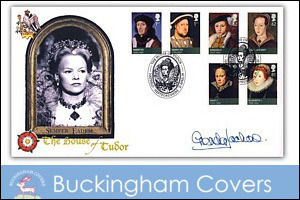 Without a doubt Queen Mary suffered considerably during these years. The mental anguish of her predicament tooks its toll on her health and she aged prematurely, suffering from rheumatism, not helped by damp living conditions, common in this century. However, it has long been believed that the Queen was suffering from Porphyria, a hereditary illness believed to be responsible for the madness of King George III (a descendant of the Scottish Queen), that would explain many of the Queen's ailments over her lifetime rather than "cruel treatment" by Queen Elizabeth. The English Queen allowed Queen Mary to take the waters at Buxton, more than once, and maintained the Scottish Queen at considerable expense. But while Queen Mary was, in many ways, the mistress of her own downfall, it is hard to not feel sorry for her. She was only 25 years of age when when she arrived in England, with so much of life left to live, but what followed were difficult and wasted years. However, despite her suffering, Queen Mary endured her captivity and bodily pains with great courage and fortitude. She did not know, as we do, what her fate was to be. 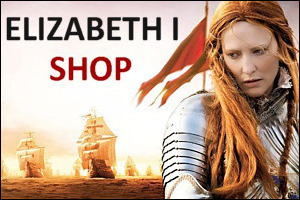 Queen Elizabeth I could have died or been deposed at any time and, if she had, then Queen Mary would have been the next in line to the throne. Her faith, and her hope that she would one day be Queen of England and free again, must have been a great comfort to her in these despairing times. Click the link below for a list of the known residences of Mary, Queen of Scots, during her years in England.